The Hidden Lake Bistro Table has a beautiful hammered stainless steel top with a nail head trim that wraps around the entire table. The table is sturdy with its turned legs in an ivory finish. The table goes perfectly with the Merrick Swivel Counter Stools that come in both counter and barstool height. Each stool features a hand-woven rush seats, metal backs and kick plates at the foot of the stool. The Montauk Dining Table is perfect for dining on a larger scale. This trestle table has a handcrafted design that includes an intersecting circle design that creates a sophisticated look. 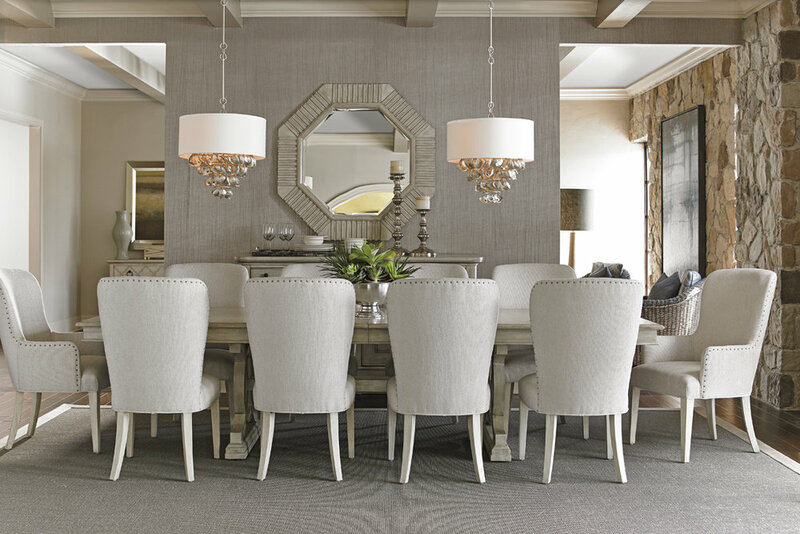 The Baxter Upholstered Chair has light shades of gray and ivory that pair perfectly with the dining table. These dining chairs feature a detailed nail head trim and a curve back that will not only bring the best comfort but style to your dining space. The Timber Point and Oakdale Buffet are available in the Oyster, Pelican Gray and Sands Point finish. The sideboard has a sophisticated look with its turned feet and detailing. The buffet features a felt lined drawers, four adjustable shelves, and two doors that open for plenty of storage for all your kitchen needs. The Sag Harbor Bed has an elegant look with its tufted headboard and detailed nail head trim. The fabric includes a herringbone weave that features shades of ivory and pewter throughout. The end bench looks stunning at the foot of the bed and is available in a leather or fabric. Featured in this picture is the Cedarhurst Nightstand that features 2 ring pulls on each drawer that makes a great storage accessory to the bed. The Arbor Hills Bed has an arched upholstered headboard with a beautiful nail head trim that frames the headboard. Also pictured in this photo is the Barrett Triple Dresser that has ring pull hardware to bring a bit of luxury to the piece. The Greenport Sofa is a great transitional piece that will fit into your casual lifestyle with its multi-layer seat cushions featuring feather down wrap that will bring you the up most comfort after a long and hard day. Its tufted buttons rolled scooped arms, optional nail head trim, and wooden finish is what makes this sofa so unique. The Saddlebrook Cocktail table pictured above has a beautiful glass top that compliments the Oyster white wood finish on the table. This piece offers spacious shelves as well for extra storage. The Ashton Quickship Leather Sofa is available in the beautiful Bay Ash leather. This sofa offers such a luxurious look with its leather and nail head trim. This sofa goes perfectly with the matching Litchfield Coffee Table pictured above. If you’re looking for transitional furniture this is the perfect collection for you. Each piece has a hint of glam while still maintaining a casual look. You can furnish almost your entire home with its wide range of options that all go together seemly. The Oyster Bay Collection will leave your guests in awe with its fashionable and unique look. Shop the Oyster Bay Collection and more Lexington Furniture at Belfort Furniture in Sterling, Virginia. Visit our showrooms for a variety of furniture styles and prices. Browsing through our 100,000 square feet of showroom space will surely inspire you.